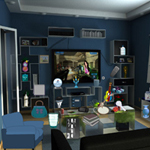 In this game you have to look for hidden objects in various locations, mitstichnosti and full of mystery. Assistant Julia teach you the basics of the game, although it's simple: look for items that get prizes, open new levels and new mysteries. For different levels provide different prizes. If you find the item is very much difficult to use the hint button. look for items that get prizes, open new levels and new mysteries. For different levels provide different prizes. If you find the item is very much difficult to use the hint button.